Stony Brook, NY, June 6, 2011 - Last week, New York Sea Grant joined other Sea Grant programs and colleagues at the 54th International Conference on Great Lakes Research, held in Duluth, Minnesota. NYSG was a co-sponsor of the event and was represented by its Associate Director, Katherine Bunting-Howarth, J.D. Ph.D. The event, conducted by the International Association of Great Lakes Research (IAGLR), featured more than 35 scientific sessions exploring large-lakes research that crosses borders, disciplines, temporal and spatial scales. Discussions were centered on Great Lakes science and policy, addressing areas as diverse as ecology, limnology, habitat, fisheries, invasive species, contaminants, climate, and water quality, as well as the vital intersections of these topics. In New York Sea Grant’s first year—1971—researchers at SUNY Buffalo studied isotherms under the ice of Lake Erie. Results helped boost commerce by extending the Lake’s navigational season. In 2011, Dr. Michael Twiss (Clarkson University) is studying productivity under the ice to answer questions about hypoxia. Dr. Joseph Atkinson (University at Buffalo) recently developed the concept of “resource sheds,” creating a web–based tool that allows users to understand the processes that underlie Great Lakes issues such as hypoxia. Over the years at Cornell’s College of Veterinary Science, NYSG–funded Dr. Paul Bowser has made breakthrough discoveries on pathogens that cause lethal diseases in Great Lakes fauna: botulism and Viral Hemorrhagic Septicemia (VHS). In 2010 Cornell’s Bowser and NYSG’s Dave MacNeill won the first–ever National Sea Grant Research to Application Award for research and outreach on virus that causes VHS in Great Lakes fish. The 180 invasive species in the Great Lakes not only disrupt the food web, but cost billions of dollars in impacts to the regional economy. 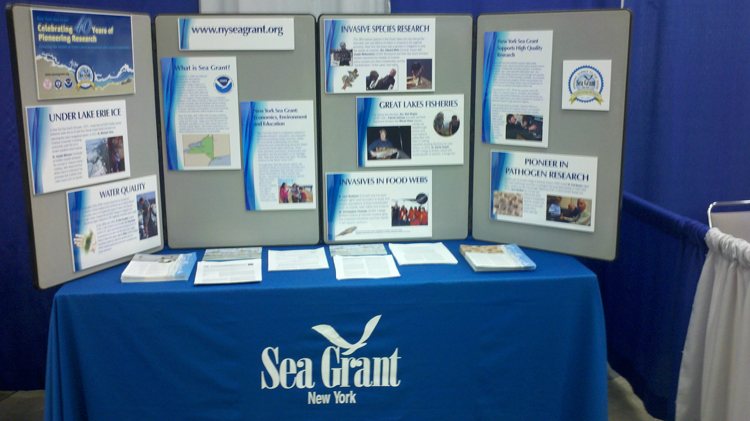 New York Sea Grant was a pioneer in mitigation to stop the spread of invasives. Drs. Edward Mills (Cornell), Joseph Makarewicz (SUNY Brockport) and their Sea Grant Scholars examined the habitats of invasive zebra mussels and other invertebrates and the “benthification” of the Lakes’ food webs. Dr. Lars Rudstam (Cornell) and his team used acoustics to study and predict populations of prey invertebrates such as mysids, both native and invasive. Dr. Christopher Pennuto (SUNY College Buffalo) looked at how the invasive goby has impacted tributaries and how readily it will expand upstream. For nearly two decades, Drs. Neil Ringler (SUNY ESF), Patrick Sullivan (Cornell) and their Sea Grant Scholars (including Micah Dean) carried out breakthrough salmon and trout research aiding New York State in making important stocking decisions for Lake Ontario. In 2010, Dr. Randy Snyder (SUNY College at Buffalo) studied growth of alewives, a forage fish. In the early 1970s, NYSG–funded researchers at Cornell and University at Albany looked at the beneficial uses of heated effluent from power plants and studied the impact of waste heat disposal in Lake Ontario. Researchers at SUNY Oswego investigated how filamentous algae (Cladophora) negatively impacted water quality. In the 1980s and 1990s, Dr. Ron Scrudato studied PCBs in Lake Ontario’s air and water. Dr. Greg Boyer (SUNY ESF) examined and developed tests for cyanobacteria and other harmful toxins from algae found in New York waters. Dr. H. Sikka (SUNY Buffalo) examined uptake by Lake Erie rainbow trout of PBDE contaminants that come from manufacturing flame retardants.